Mailnag, an email notification daemon that integrates with Gnome Shell through an extension, has seen a new release over the week-end. Mailnag is an email notification daemon for POP3 and IMAP servers. It comes with predefined settings for Gmail, GMX, Web.de, and Yahoo email services, and it offers features ranging from triggering popup or sound notifications on new email arrival, a spam filter, or running an user defined script when receiving new emails. 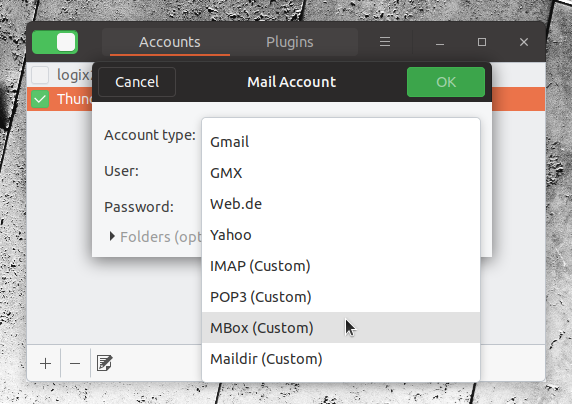 Over the years, Mailnag has supported a wide range of desktop environments: Gnome Shell, Unity, Pantheon, Xfce and Cinnamon. Nowadays though, only the Gnome Shell extension is actively maintained (and the only plugin in the Debian/Ubuntu repositories). The Gnome Shell Mailnag extension (needs Mailnag daemon to be installed on the system) shows an unread email indicator in the top panel. The indicator menu shows new email details like the sender, email title, date, and a small email body excerpt, as well as options to mark all emails as read, and to check for new emails. What's more, the new Mailnag version includes support for mbox and maildir backends. As a tip, a use case for this would be to show the number of unread messages from Thunderbird email client, in the Gnome Shell top bar through Mailnag. This way you can replace Birdtray or similar, and use Mailnag to track unread emails for both local and online email accounts. With Mailnag 1.3, the Mailnag Gnome Shell extension has also seen an update, in which the extension was ported to ES6, and GNOME 3.32 support was added. Mailnag can be found in the repositories for many major Linux distributions, including Debian (and Ubuntu, Linux Mint), Fedora, openSUSE, Arch Linux, and more. It's not the latest Mailnag 1.3 in most cases though. The Mailnag extension is also on extensions.gnome.org. Remember that the extension alone doesn't work - it needs Mailnag (the daemon) to be installed on the same machine. After installing the extension, reload Gnome Shell (press Alt + F2, then type r and press Enter to restart Gnome Shell with X) or logout/login, make sure the Mailnag extension is enabled in Gnome Tweaks, and open the Mailnag Configuration from the applications menu. Add your email accounts and close the Mailnag Configuration window to start using it. It's worth noting that it looks like the settings are not applied until the Mailnag Configuration window is closed. On other Linux distributions, the options are to install the version from your distribution's repositories or install the latest Mailnag from source.